If you are into fine chocolate and start meeting equally interested souls, you might have the chance to taste something special from time to time. The chance of finding a bar of Indonesian bean-to-bar chocolate on a shelf in a shop around the corner is slim. Unless you live in Indonesia of course. I was very happy to be invited to a meet and greet with Indonesian bean to bar chocolate makers in Brussels a while ago. Mike&Becky hosted a special evening where you had the chance to get to know different Indonesian chocolate makers, try their products and exchange thoughts. One of the companies present was Krakakoa from Bandar Lampung Sumatra. Asia origin chocolate is on the rise and it was great to hear that the movement is finding a way into the local market as well. I find it especially intriguing to try products made by people who are used to a whole other flavor palate than me as a European. So today I have the chance to share my views with you, based on a very nice bar I received during the meeting. Krakakoa (nice play of words on the famous Krakatoa volcano), is based in Sumatra, one of the biggest Islands of the archipelago forming Indonesia. The country is hardly the first one you think about when it comes to chocolate or even a cocoa origin. However, there is quiet a history of cocoa in Indonesia. The first cocoa trees were introduced into South-Asia in the mid 1600’s. The first written mentioning of the plant in Indonesia dates back to 1778. Especially the last 25 years, cocoa has boomed according the International Cocoa Orgainisation (icco.org) (1). Cargill states Indonesia beeing the third largest cocoa production country in the world by now (2). Smallholders make up for most of the production (87%), while state plantations (8%) and large private plantations (5%) produce the remaining part. Most of the cocoa grown here is bulk cocoa, aiming at high yields and less interesting flavor profiles. Fine flavor cocoa is a minor part of production. 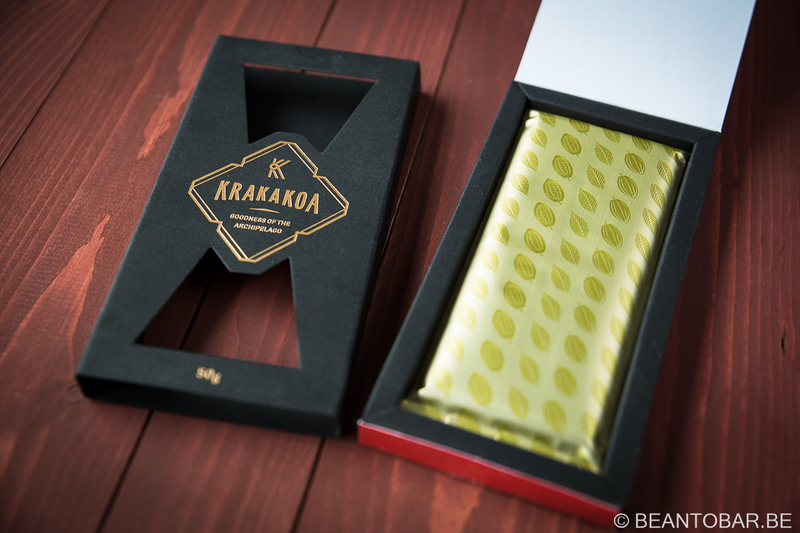 Krakakoa is one of the new companies who aim to introduce fine chocolate in the Indonesian market. Nowadays, most Indonesian people prefer sweet industrial milk chocolates. Just like many European and American chocolate makers, they are directly in contact with the farmers and support them by offering education and formation, process follow up and by paying a higher price for the cocoa beans. This way Krakakoa wishes to secure themselves of good quality cocoa in a volatile market where stable farmer/chocolate maker relations are not yet self-evident. 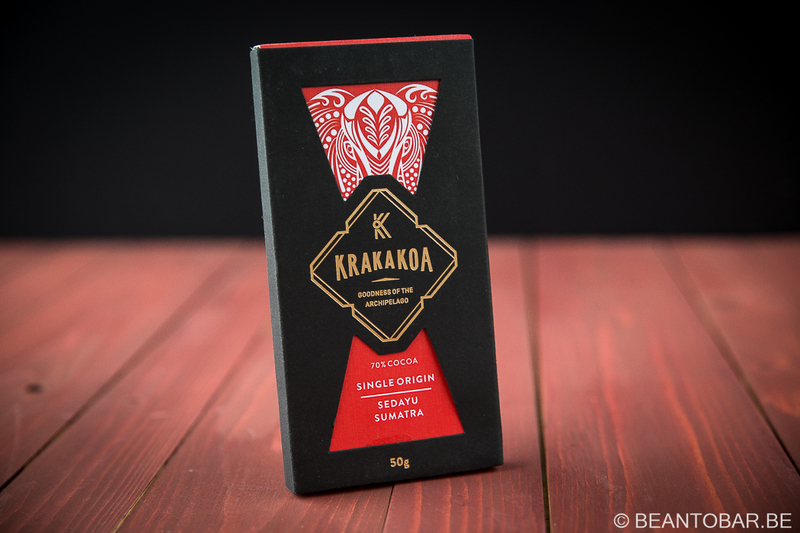 The bar on my table today, is part of the Single Origins collection of Krakakoa. This is their top of the line chocolate, next to a range of flavor infused bars. This specific chocolate is made with cocoa grown in Sedayu village – located in the island of Sumatra. It promises spicy and fruity notes and states the cocoa used was harvested in 2016. 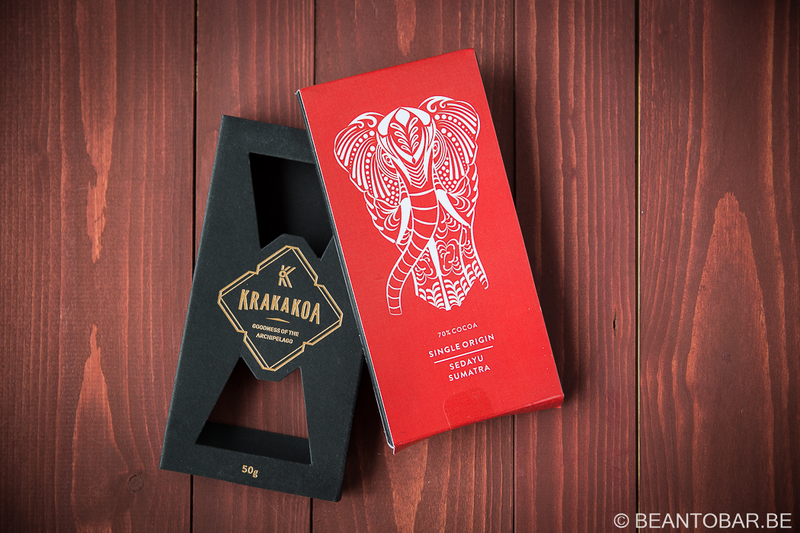 Indonesian chocolate might not be commonly found in Europe, but when it comes to packaging, Krakakoa has done an amazing job. I was amazed by the complexity of the box. An outer sleeve in black shows the company logo and the weight of the bar (50g). Flip it over and you get some info on the single origin line, the address of the company, a direct trade stamp and new to me, a halal certificate. Shows how often I sample chocolates made in a predominant Muslim country. Inside the sleeve, a bright red box appears – showing a graphic design of a forest elephant, indigenous to the Sedayu National Park in South Sumatra. This box states the origin and the percentage of the chocolate. On the back, more info on the origin, flavor notes and nutrition facts. The ingredients list cocoa beans, cocoa butter and sugar sound promising. And still we are not getting to the chocolate itself. The red box has a lid that swivels open reveal a gold fol wrapper – decorated with cocoa pods and leaves. The whole set-up of the package makes it feel very special and builds expectation. It definitely feels like a premium chocolate bar. When you finally get to the actual bar, you notice a well known design. It works fine, but a brand specific mold design would make it stand out even more I feel. The chocolate looks fine and has a nice shine to it – even though temperatures have been very high here in Belgium last month. Not a sign of bloom. Good. The mold design shows perfectly, yet the underside looks a bit uneven and quickly done. This is but a detail, but is noticeable. Let’s move on to the actual tasting. Taste: A flash of licorice starts the flavor off, followed by earthy notes, coffee and leather. A honey like sweetness lingers on the palate and dark berry fruits are added. It has a very ripe black berry jam feel to it. Amongst the fruits who shine, pops of ginger and a surprising spicy mint can be detected. Coffee and wood flow underneath the main aroma and brings balance to the overall flavor. The melt is slow and the texture of the molten chocolate is a tad thicker than what I’m used to. Gradually, the fruity notes are pushed aside by gentle wood tannins and more coffee notes. I have an overall purple feel to this bar. Dark, Lush and generous, sweet and warm. The after flavor is gentle and lingers on nicely. It keeps the light spiced notes alive and offers warm chocolate flavors for a prolonged time. I almost find it hard to describe this bar. The flavor notes are complex and ever changing, depending the moment of day your try the bar. It has a very different feel to it compared to what I have tried of Asian chocolate so far. 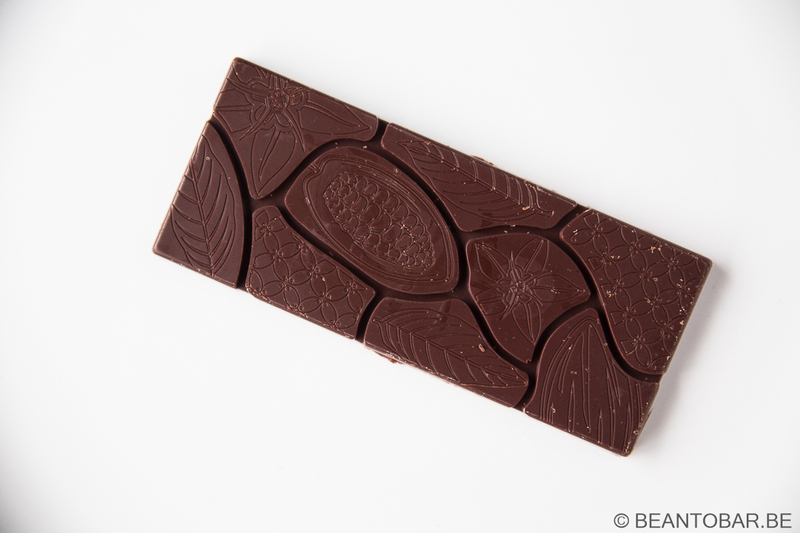 The spices are surprising and there is an overall exotic feel to the chocolate. I almost lack the right flavors in my personal experience database. I’m very certain someone familiar with the aroma’s of the islands of Indonesia could far better pinpoint the ones you find in this bar. It entices me. It keeps luring me back and frankly I’ve savored more than half the bar just to write this review. I will feel sorry when it is gone. The melt and texture are a bit thicker than normal. I noticed this in almost every bar I tried during the Indonesian chocolate session in Brussels. The chocolate makers explained me that the cocoa butter used in the bars is also produced with local cocoa and has very different characteristics compared to butter made with South-American or African cocoa. It resists melting to a higher degree, creating a different eating experience. 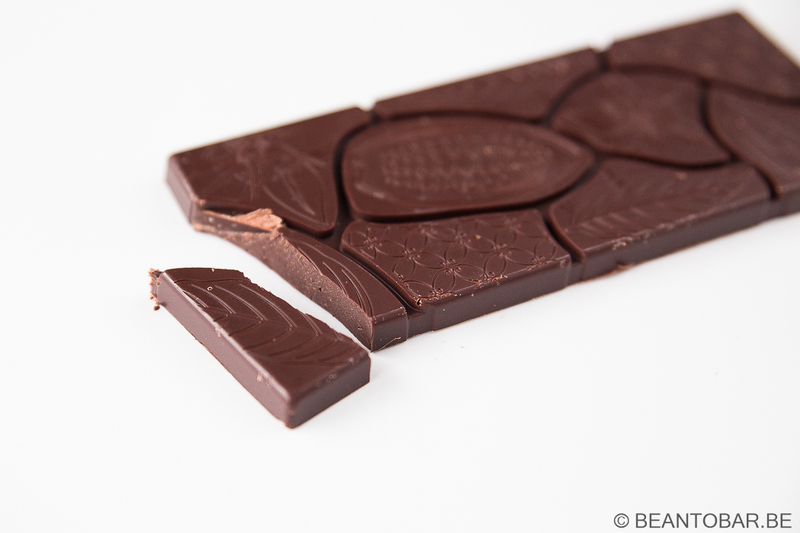 This might put off some people, especially those who are accustomed to buttery smooth European style chocolate. But if you are into chocolate because of the wonderful flavors it can deliver, you should definitely try this one when you have the chance. So far it is only retailed in Indonesia and Singapore, but I would hope it will one day be available in a far wider area of our globe. It deserves to be.